So you have just a little over a week to visit England for the first time, how do you plan your trip to see what you must see and make the best use of the short 7 days? 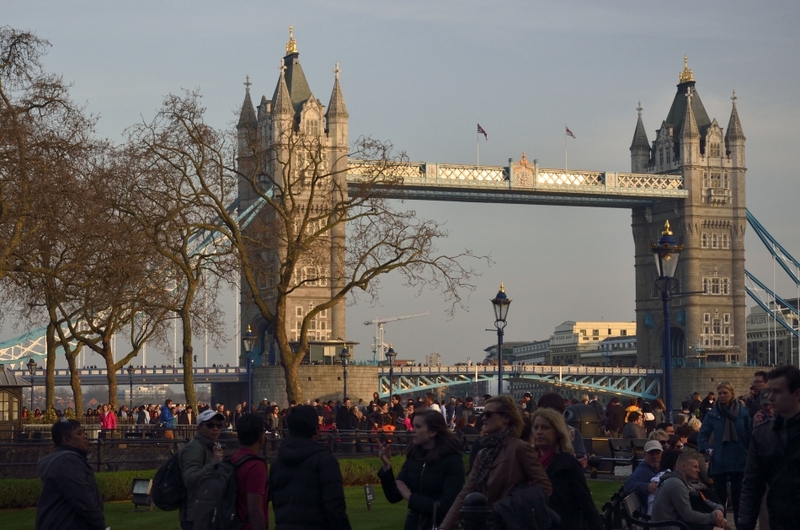 Even if you stay in London the whole time, you would still be overwhelmed by all the places suggested by the travel guides and trip advising websites. But if you do visit London only, you would regret missing out the countries and rolling hills that some parts of England are famous for. Let me put it this way, no matter how you plan you trip, 7 days is way too short to cover the minimum must-sees in England. Still, how do you spend your week to make the trip worth it? I am sure that there are 10 millions different combinations of options you can make. The toughest part is making the choices. Following is a 7-day London-Stonehenge-Cotswold trip that went quite well for a first visit to England. While recounting our journey, I am able to make amendments to improve the plan, so that whoever maybe interested in making the same trip will learn from my (painful) lesson. I know you want to see all the 20 must-visits of England from some tourist websites. You want to visit University of Cambridge and Oxford and you want to see the Edinburgh Castle and of course the Stonehenge. You will make ambitious wish lists before eventually realizing how unpractical you plan is. Seven days is extremely short for exploring the vast wealth of treasures the land of England offers in both history and geographic beauty. Finally accepting our limitation in time and as a first visit, we decided to stick to London for the first 5 days (in reality only 4 and a half days) and go for Stonehenge/Salisbury/Old Sarum and Cotswold villages for the last 2 days. On our way back to London Heathrow Airport, we would stop by Oxford for 2 hours, a little more than a glance. Even this list will be deemed impractical or unrealistic to the eyes of the travel experts, but we were unwavering in our resolution of visiting the places in this compromised list. In a week's time, It will be proved that the travel experts are right about the foreseen hastiness of our trip, yet we were glad to make it to those places. We just wished we had had more time. Make the necessary reservation for accommodation at the places you decided to stay. For the areas of interests listed above, we decided to stay in London for 5 nights and and 2 nights in a Cotswold village, in our case it's the Easterleigh Cottage at Great Rissington in Gloucestershire. Since there are 7 of us, we rented an entire flat or cottage at both places to save costs and be able to cook sometimes. The London flat was booked through the breakfast and bed website Airbnb and here is the link of our flat. Both places turned out to be great choices. In addition to finding a place with physical layout and capacity that suit your need, the one single key success for an ideal London apartment is its proximity to any public transportation, be it bus, tube or train stations. Since the West End or the Central London is near the Charing Cross Station (north of Westminster Station), I would recommend finding a place that is within 3 maximum 5 miles radius to that center region. Within the zones 1-9 in London, it seems to be still cheaper to travel with Oyster or Travelcard. Oyster card is a pay-as-you-go type of ticket which gets discounted fare every time you use for a ride. Travelcard has daily and weekly type which allows unlimited use on all transportation during the specified period. Oyster card can be use in all 1-9 zones in London, while travelcard can only be used in zones 1-6. Here is a comparison of the two ticket types. You should read about the various restrictions of these types of tickets online if you are deciding on which is best suited for your purpose. If you know that you will be taking train rides to places out of zones 1-9 London, such as Oxford, on certain days, it is also advised to purchase the train tickets in advance to get cheaper fares.There seem to be a lot of websites claiming to have the cheapest train fares. You will need to shop around and compare fares. Here is a the link of one of the websites. The prices of the tickets for 2-3 days in advance are significantly cheaper than tickets for the next day. Some attractions in London require early bookings online to ensure the availability of the tickets on the day that you are visiting. 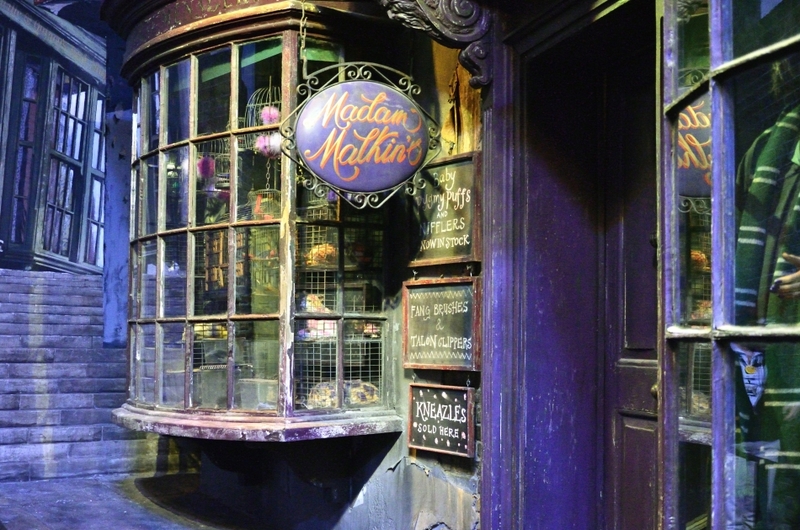 Thanks to the two teenagers in our travel group, the Werner Brothers' Harry Potter Studio was one of our destinations on the first full day in London. The tour tickets for the studio are only available online. You need to purchase a few weeks in advance in order to get tickets for the day and time of your choices before they are sold out. The tour lasts about 2-3 hours. We purchased a 3-day London Pass with travel (travelcard) for everyone about 2 months before our departing date . Travelcards included in the purchase are three days of off-peak zones 1-6 travelcards. That means we can only use the travelcards after 9:30 pm Monday-Friday, all days on weekends and holidays. This off-peak time restriction didn't really post too big a problem, as it was passed 9 am on most days by the time we finished our morning routines and get to the station. The London Pass with travel turned out to be the key of our success in touring London. The passes and travelcards saved us a great deal of time in the planning of our daily tours and money in entrance and transportation fees during the visits of places. The 2 months before our trip provided plenty of time to receive the passes and travelcrads along with the London Pass brochures and use them for the trip planning. The delivery took just about a week or less, so order the passes 2-3 weeks before your trip should be early enough. The London Pass is effective for a year from the time of your purchase. The travelcards are designated for the dates you entered, but can be changed by going through certain procedures. Even if you order at the last minute before your departure, I believe you can pick up the passes at some locations in London, but then you won't have the brochure for your trip planning. Travel by car - For the London stay, a car is not needed, or best avoided, as finding a parking would be a nightmare. Public transportation in London is versatile and convenient. I reserved a full-size 7-seater van to be picked up from London Heathrow Airport for the last 2 and half days. Train is an option for some places, but if your time is limited like us, then traveling via a car is definitely a better choice for maximizing the number of covered places. Driving on the left side of roads - By renting a car presumably you are aware that the driver is sitting on the right side of the car and you will be driving on the left side of the road in England, which is a major challenge for the left-side drivers who are used to right-side-of-the-road driving. In addition to this driving challenge, the driving lanes on the England highways and roads are significantly narrower than those from, say, United States and for this reason, try to avoid renting a huge van. I am sure that the vehicles in England must be designed to be able to drive on the majorities of the roads, but your sense of the width of the car will not be as accurate driving on the unfamiliar side of the road and will tend to drive over the edge on the passenger side. Metropolitan Street and Transportation Maps - One of the homeworks I did for preparing the map is marking all the places of interest with numbers on several enlarged Google maps designated for different parts of London. The London Pass booklet has some street maps for the suggested walking tours, but they are very small. Print out at least the letter size of London Tube Map and key bus routes in Central London map. They will come in handy for planning each of your day trip and actually a must-have for looking up the streets and lines of tubes or buses to go anywhere in London. Tubes are in general faster than buses, but taking the 2-story London buses itself is a nice way for touring London. We all enjoyed taking buses after discovering how fun it was sitting at the front row on the 2nd level of the bus around the city and would try to take bus to places if we could. Destinations map - We plan to visit University of Oxford, so a campus map like this will be useful. Power outlet US to UK adapter - The power outlets in UK have different configuration from those of US. Depending on where you currently live, the electronic devices you are using, like cell phone and computer might not be usable in UK. For US devices, you need to bring something like this or similar to be able to charge your devices in England. We were ignorant about this fact and had to spend £10 for two adapters at Paddington station. GPS - if car travel is planned, bring a GPS that has England map data or a smartphone with large screen. Smartphone phone car charger adapter - if you plan to use your smartphone GPS on the road, definitely bring the car charger adapter. A fully charged cell phone battery only lasts no more than three hours on the GPS app. A car charger will save you a lot of hassle of changing sim card to another charged cell phone. A smartphone with a large screen will be helpful too. Comfortable walking shoes - You are practically walking all day while touring London and you really need the most comfortable walking shoes or just wear sneakers. I made the stupidest mistake in this trip by wearing a pair of low hill boots with very thin and poor quality soles. Eventually I had to buy additional thick shoe soles from a pharmacy to save my miserable feet at the end of the 5th day. Imagine how my feet suffered for 5 days ! London SIM card - For the car trip, a GPS is an absolute must-have, unless you know the map of England from the back of your brain. If you can get hold of a GPS containing map data of England, that will be the best solution. If not, a smartphone with Goggle Navigation app will do. Purchase a sim card at the airport that comes with unlimited data will provide you with the needed network for a mobile GPS. As mentioned above, be sure to bring a smartphone with large screen and a car charger. Transportation to London accommodation - You can take a combination of tube, bus and taxi to your London hotel or flat. Since we are 7 people with luggage, we decided to hire a people carrier with an 8 seater van to pick us up from the airport. It cost us £80. The company of the people carrier is called Express Airport Cars and here is their website. We hired them again 5 days later from our flat back to the airport to pick up our van. Beware of the side of coming cars when crossing streets - When you are crossing the streets in London, remember to first look right for the cars coming on your side of the road instead of left like in US, then look left if it's a two way street. I almost got hit by a 2-story London bus the first night in London when we were crossing the street near our flat! I kept looking to my left without realizing that a bus is coming in my back! We really had just 4 full days in London, excluding the day we transported from airport to our flat in London. We planned to start using London Passes and Transportation on the 2nd full day, so naturally we spent the first full day at places that are either free or not covered by the London Pass. Following is a rundown of our day to day activities for the whole period of 7 days. I'll hereafter refer to our first full day as Day 1. Each of us purchased a (London) zone 1-6 off-peak day travelcard on this day, as we plan to start the 3-day London Pass and travel on the next day. Oxford Street and West End - Take any line of tube that can get to Oxford Circus (make the necessary connection to Bakerloo, Central and Victoria lines). Get off at the Oxford Circus station and walk east along Oxford Street towards Tottenham Court Road Station, you will see many of the brand name shops along the street. This is one of the most popular shopping areas in London. A little south of Tottenham Court Road Station is the so-called West End or central London. It includes Covent Garden, Leicester Square and Soho which are buzzing with boutique shopping, bars, covered piazza and restaurants. 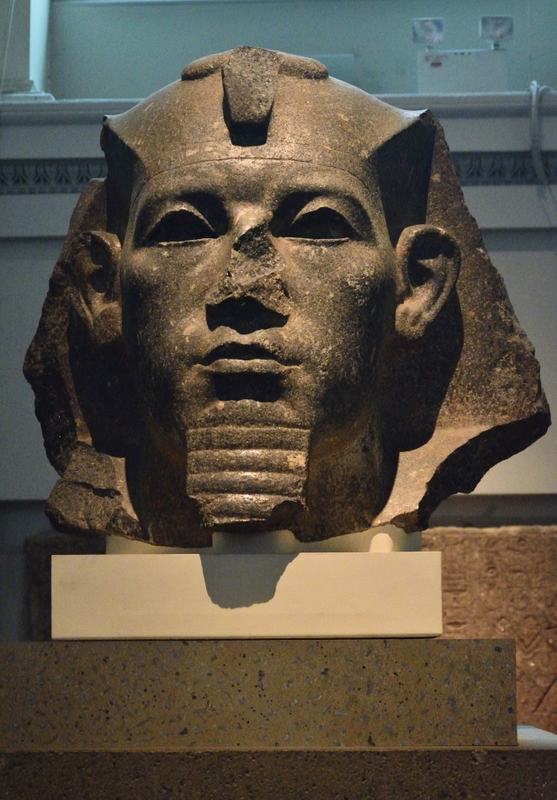 To explore the whole area is another day, but it's an alternative for people who are not keen on museum visits. 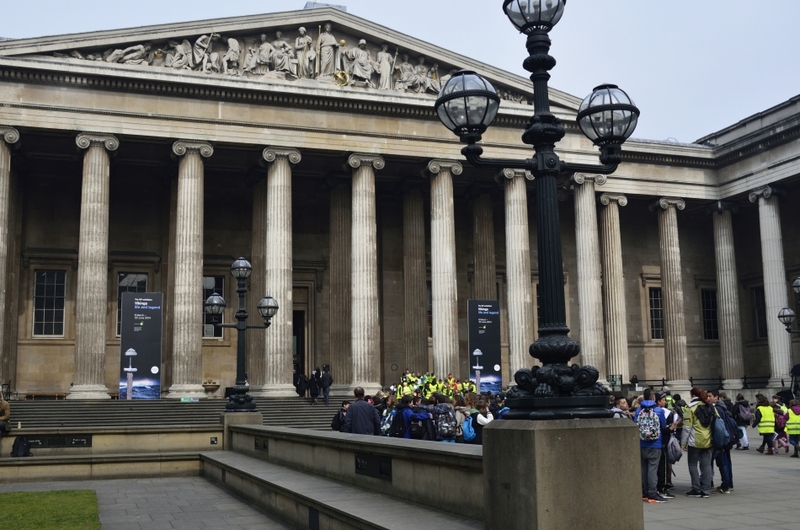 The British Museum - located between Tottenham Court Road Station and Holborn Station on Great Russell Street, opens daily from 10 am to 5:30 pm. The admission is free. You can spend all day (or all week) here, but if time is limited, plan to stay at least 2 hours. 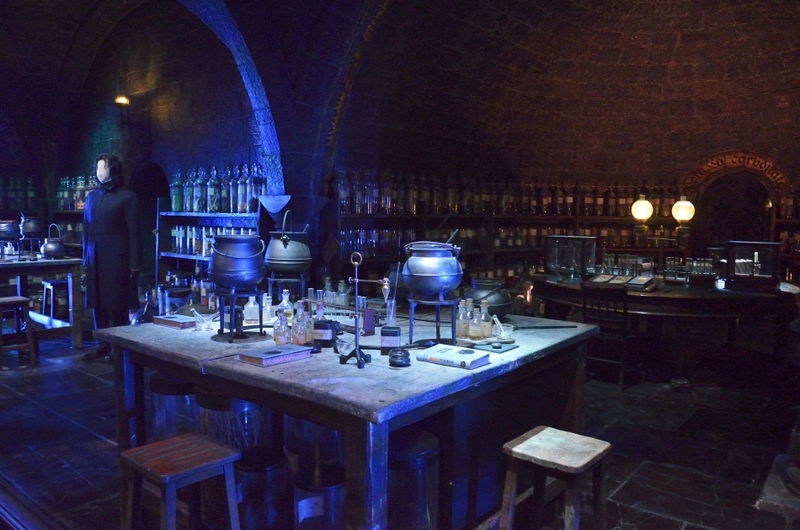 Werner Brothers' Harry Potter Studio - The studio is located in Watford, about 20 miles northwest of London. 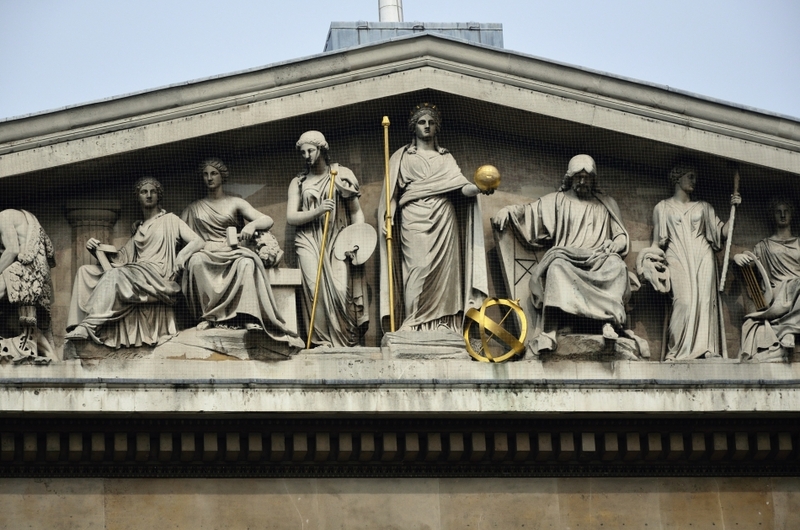 The closest train station to The British Museum is Euston Station, about a 20 minutes walk (0.9 mile) from the British Museum. Take a train from Euston Station to Watford Junction and then take the studio's shuttle from Watford Junction to the studio. The shuttle costs £2 and cannot be covered by the travelcard if you are using one. The train ride takes from 16 minutes to 47 minutes, depending on the speed of the train (some are slow and some are fast). Check this website for train schedule and arriving time. You are adviced to arrive 20 minutes before your scheduled tour time. 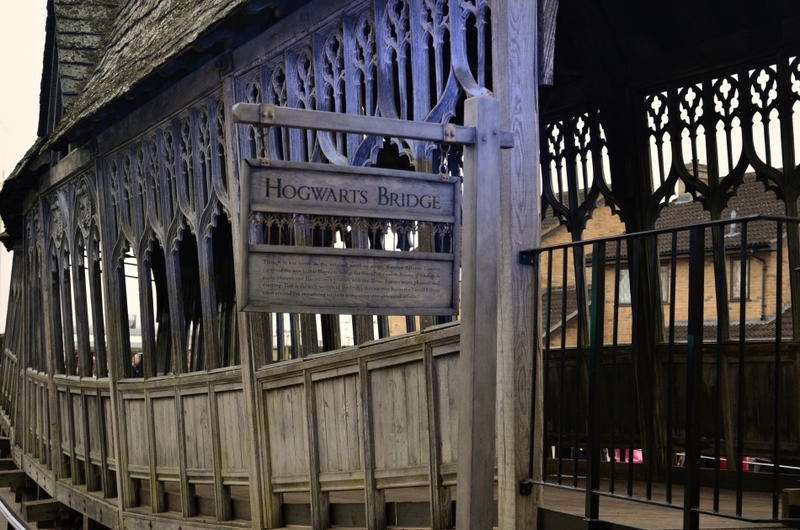 King's Cross Station - If your Harry Potter fans haven't had enough of Harry Potter in one day, the King's Cross Station is just 1 stop away from the Euston Station taking a Victoria Line tube. I doubt the "9 and 3 Quarters" platform in the Harry Potter movie was actually shot in this station, but there on one of the walls is now an artificially aged patch of wall with the sign of "9 and 3 Quarters Platform" and a luggage cart half disappeared into the wall for Harry Potter fans to take pictures. There was a long line of fans waiting when we got there. This is the most feature-packed day of all! Make the necessary connection to get onto Central or Circle or Jubilee lines and get off at Westminster Station. Big Ben - We called this the "Big Stupid Clock" in Chinese, but it's not stupid looking at all. It's the nickname of the magnificent clock tower, Elizabeth Tower. 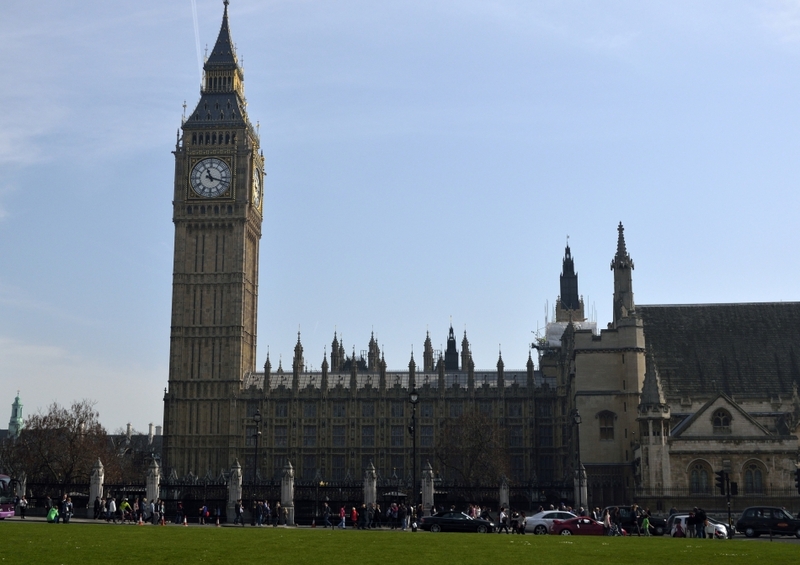 It stands at the north end of the Palace of Westminster or Houses of Parliament. 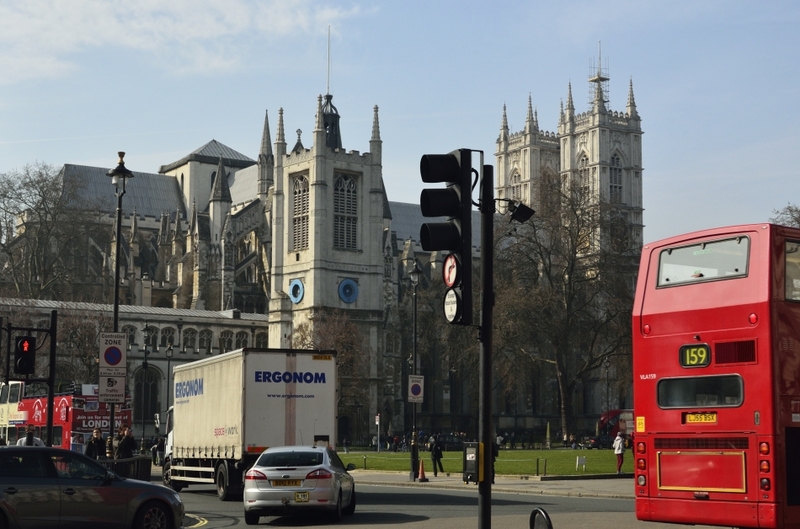 As soon as you get out of the Westminster station to Bridge Street, you will see the Palace of Westminster in front of you and the Big Ben slightly to the left towards the River Thames. London Eye - If you have time, walk on the Bridge Street towards the Thames River. A giant Ferris Wheel on the other side or south bank of Thames River. 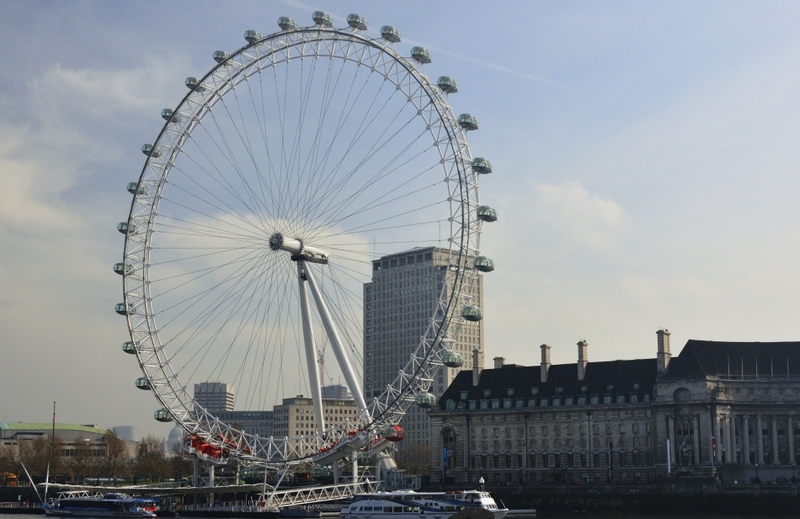 It is a popular paid observation wheel that offers spectacular views of London. We walk along the river and took some pictures with it, but didn't get on the rides. Jewel Tower - We didn't get to visit Jewel Tower because of our limited time and flawed planning. 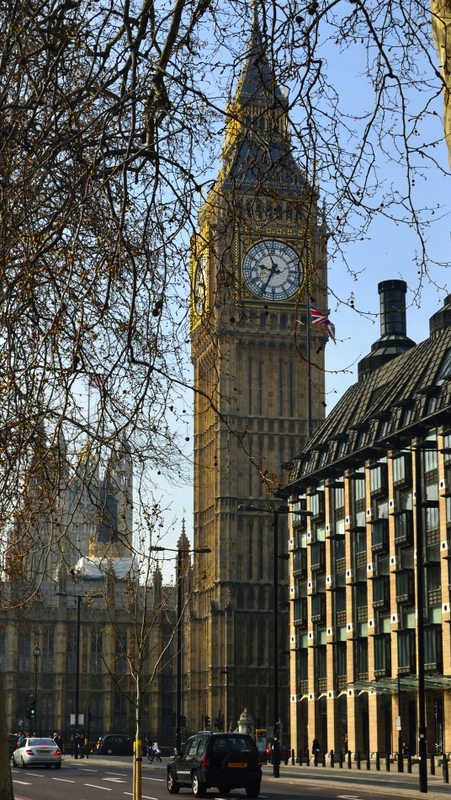 The Jewel Tower is located right across the street from Houses of Parliament on Millbank Street. 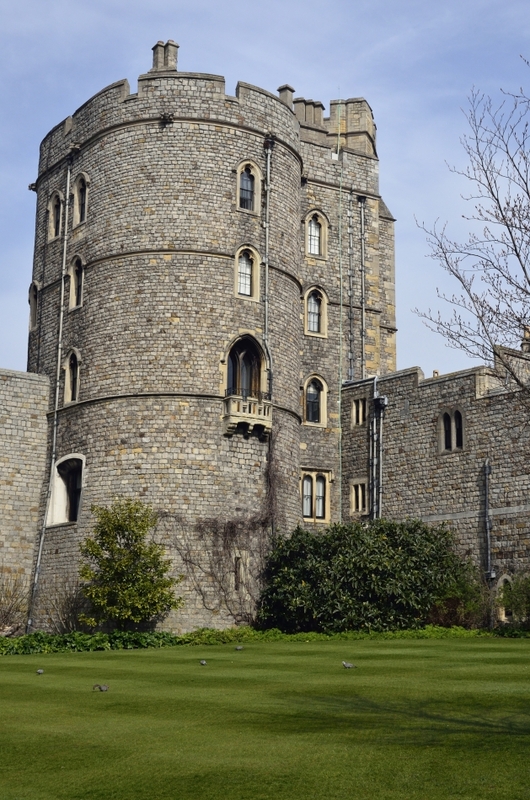 It was built to house the King's personal treasures since 1365. From 3 November through March, it is open 10:00-16:00 on weekends only, April - September 10:00-18:00 and October- 2 November 10:00-17:00. Admission is covered by London Pass. 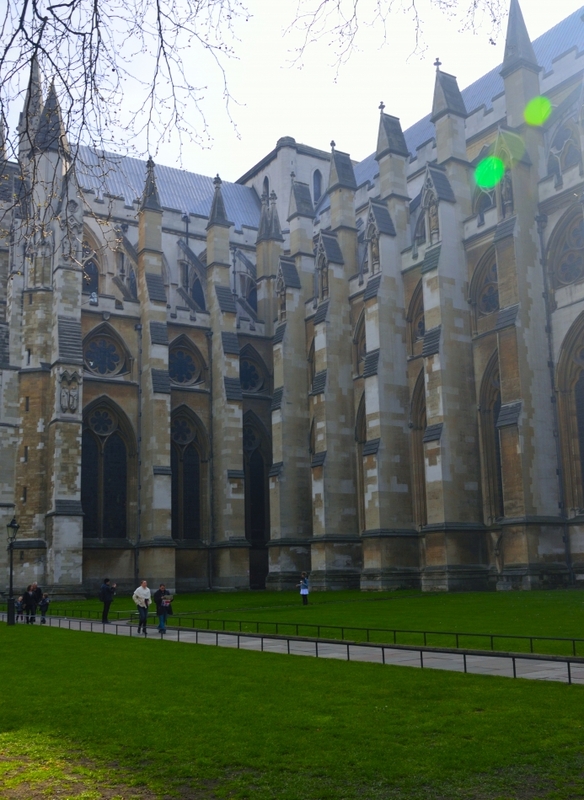 Westminster Abbey walking tour - This is a walking tour suggested on page 24 of the London Pass Brochure. 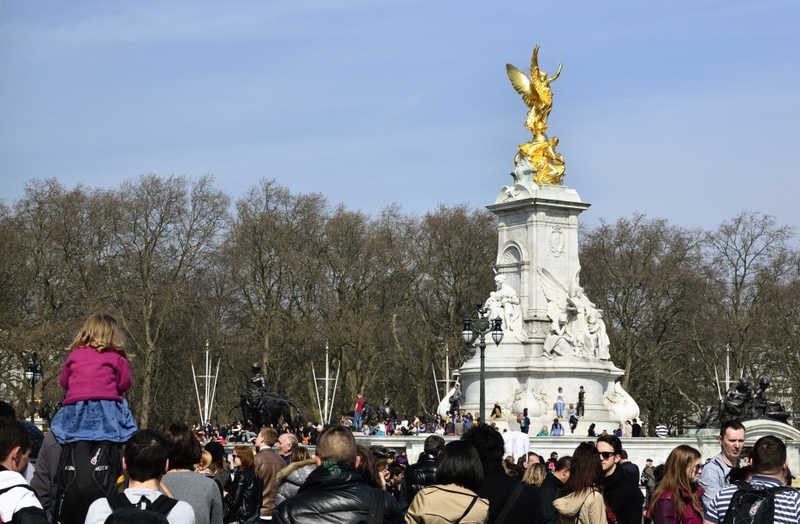 In this walking tour you will see the Houses of Parliament, Westminster Abbey, St. James' Park, Buckingham Palace, St. James' Palace, Piccadilly and Trafalgar Square. 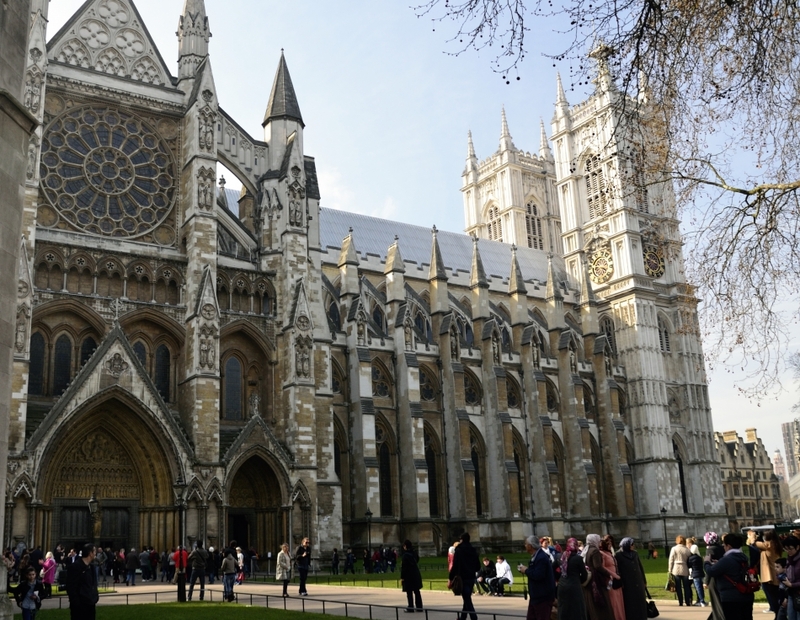 Admission to Westminster Abbey tour was at least £18 and is covered by London Pass. The whole tour took about 2 hours. The rest of the places were either free or not covered by London Pass (eg. St. James' Palace and Buckingham Palace), we just walked by. There is a ceremony of guard changing at Buckingham Palace between 11:30 am and 12 pm daily, although the change of guard was canceled the day of our visit, which was Saturday. Check this website for confirmed date and time of guard change parade at Buckingham Palace. 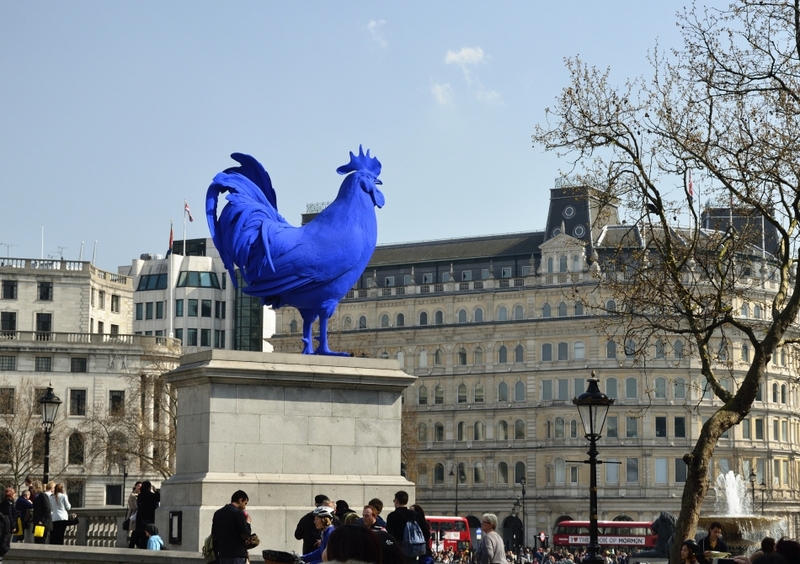 The Trafalgar Square is a really interesting public space filler with passing tourists and all kinds of street performers (see pictures below). You should check it out. By the time you finish visiting the places above and grab a bite to eat, it may have already been well into the afternoon or around 2 pm. In our trip we then made a mistake by going to London Tower next after visiting The Monument and was too tired to explore London Tower and only did a quick walk through there. If I were to do it again, I would go to the Tower Bridge Exhibition which is a shorter visit. The plan for the day was taking the City Cruises Thames River Cruise (covered by London Pass) either from Westminster Pier to Tower Pier or vice versa. We tried to take the Thames River Cruise from Westminster Pier after the above visits in mid-day only to abandon the plan due to a long waiting in line. We went ahead and took the Circle or District tubes the Monument Station if you plan to visit The Monument. Otherwise, go straight to get off at Tower Hill for Tower Bridge Exhibition. We successfully took the Thames River Cruise from Tower Pier after finished all the visits back to Westminster Pier as the crowd had dispersed by the late afternoon. The Monument - The Monument is a landmark built to celebrate the City's rise from the ashes of the 1677 Great Fire. You will climb 311 steps on the spiral stairs to the top to enjoy the breathtaking view of London. Tower Bridge Exhibition - The Tower Bridge Exhibition is open daily from 9:30 - 17:30 October - March and 10:00 - 18:00 April - September. Admission is covered by London Pass. 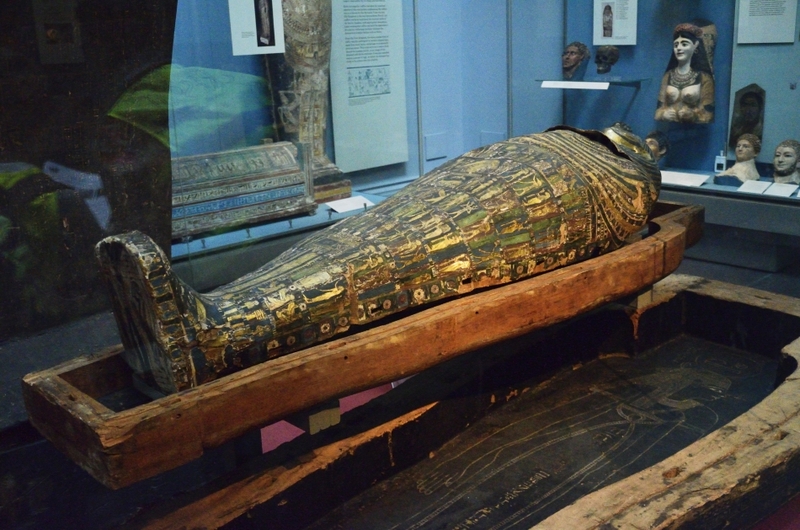 If I were to do it again, I might choose to visit London Bridge Experience and Tombs instead of Tower Bridge Exhibition. The London Bridge Experience is located by the London Bridge and close to The Monument. It's open daily from 10:00 - 17:00 on weekdays or 10:00 - 18:00 on weekends. It looks scary! Admission of £24 is again covered by London Pass. City Cruises Thames River Cruise - You need to go to the Tower Pier which is in walking distance from London Tower or Tower Bridge to the take Thames River Cruise from Tower Pier back to Westminster Pier. You will need to first get your River Red Rover ticket with your London Pass before wait in the line for boarding the boat. The one-way cruise took about 30-40 minutes. The ticket is then supposed to allow you to hop on and off any of the City Cruises' boat all day, but in reality there are always too many people waiting in line that you will hardly have time to take more than once a day or in your entire trip. 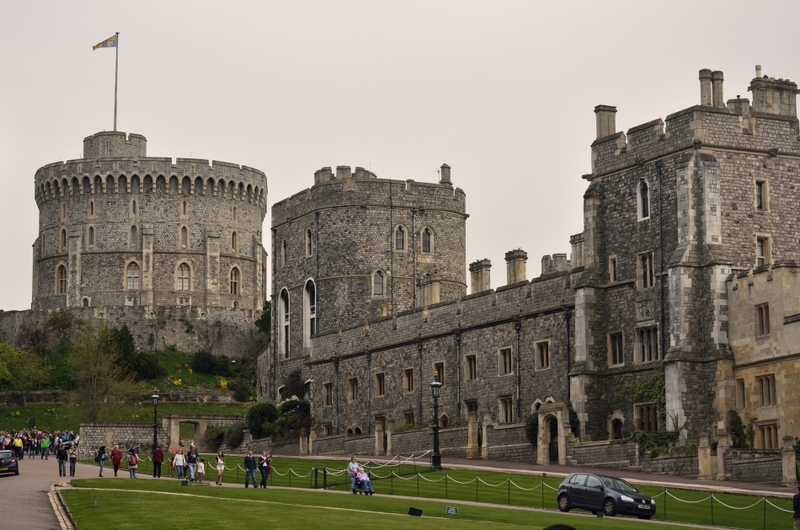 Windsor Castle- This is an official residence of Her Majesty The Queen and is located about 20 miles west of Central London near Windsor. The tour is open daily from 9:45 - 17:45. To get there you need to take a train from London Paddington Station to Slough using your travelcard. Check here for the train schedule at Paddington. 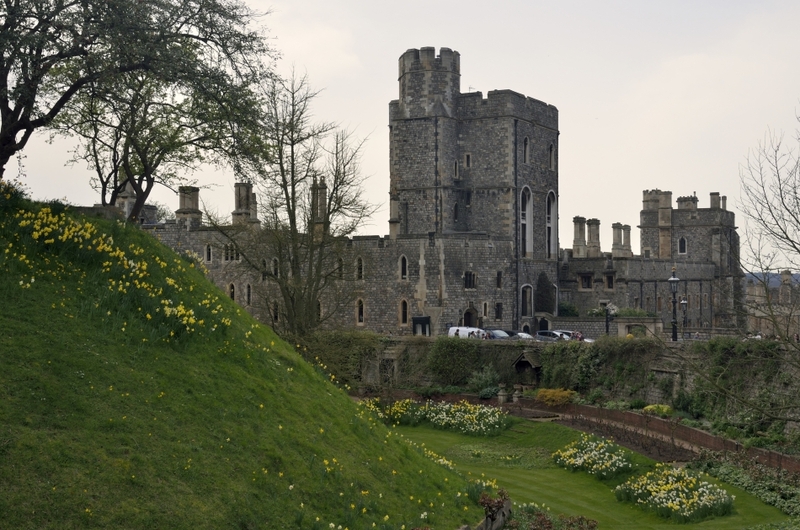 Then change to a train at Slough that takes you to Windsor Castle with your London Pass. Immediately next to the train station has developed into a fashion shopping area. Flanking the castle are streets bursting with shops, restaurants and souvenir stalls. We spent 3-4 hours at the castle and the area, one of the highlights of our whole trip. I wouldn't miss this one for anything. 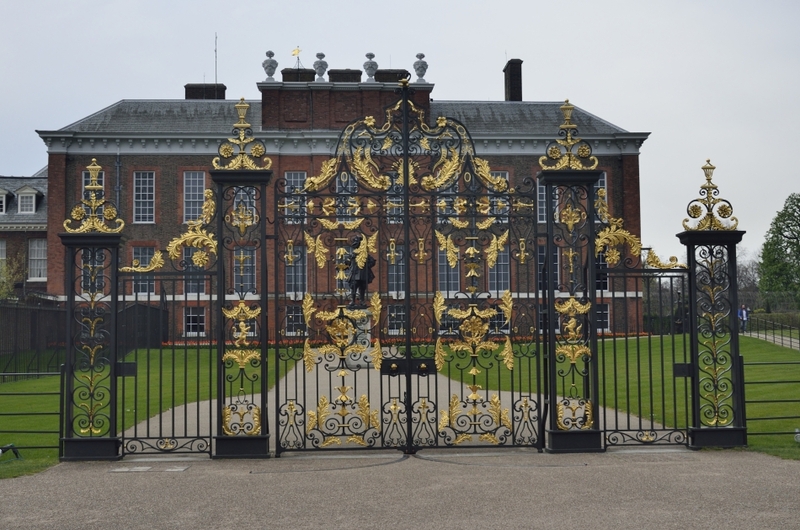 Kensington Palace - Kensington Palace is open daily from 10:00 to 18:00. By the time you come back from Windsor Castle to Paddington Station it maybe well past 3 pm, so watch your time. Leave at least 2 hours for the visit. Take a Circle or District Line tube from Paddington Station for just a few minutes and get off at High Street Kensington Station. It's located next to Hyde Park. The Palace showcases the lives of several generations of Britain's royal women including Queen Mary, Queen Victoria and Princess of Wales (Diana). Stroll through the Kensington Garden and Hyde Park afterwards if you are up to more walking. Hampton Court Palace - This Palace was former home to King Henry III and is located about 13 miles southwest of Central London. It's open daily from 10:00 to 16:30, so naturally you should start your trip in the morning. There are two ways to get there, either by overland train at London Waterloo or by R68 bus at Richmond Station. We took the train from Waterloo Station, because we found a bus that goes straight to the Waterloo Station from the Vauxhall Station. Again, check here for train schedule to Hampton Court at Waterloo Station. Hampton Court Maze and the Great Vine - The Hampton Court Maze was claimed to be the most famous Maze and the Great Vine the largest grape vine in the world. We went to the Maze but missed the Great Vine (we might have seen it but didn't realized that was it) and we enjoyed getting a little lost at some point. It took us at least a good 30 minutes to get out of the Maze before we screamed for help. 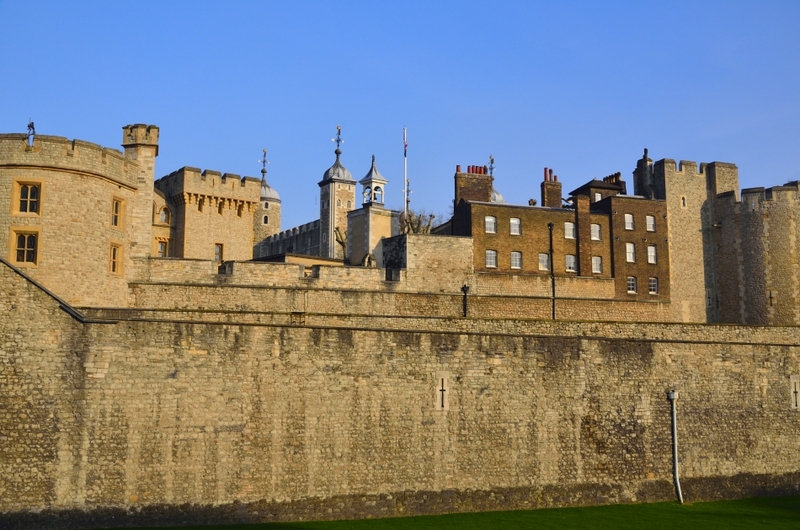 Tower of London - The Tower of London was founded at the end of 1066 as part of the Norman Conquest of England . 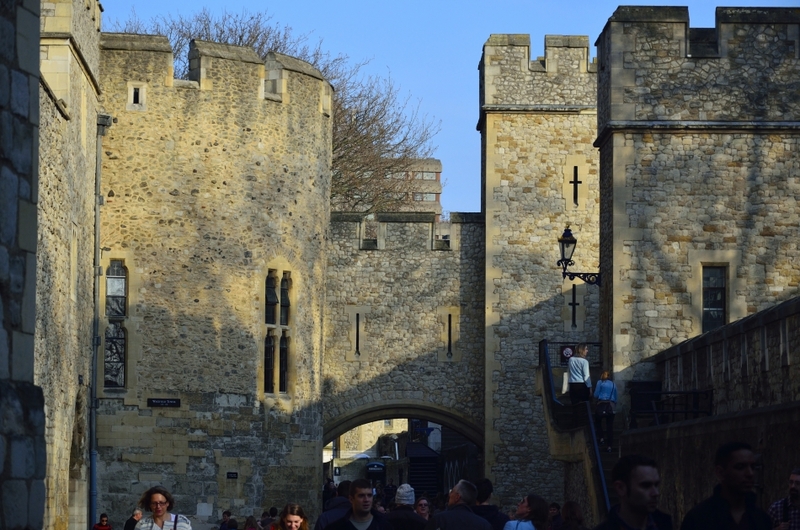 The White Tower which was the reason the Tower of London was named, was built by William the Conqueror, the first Norman King in England, in 1078. 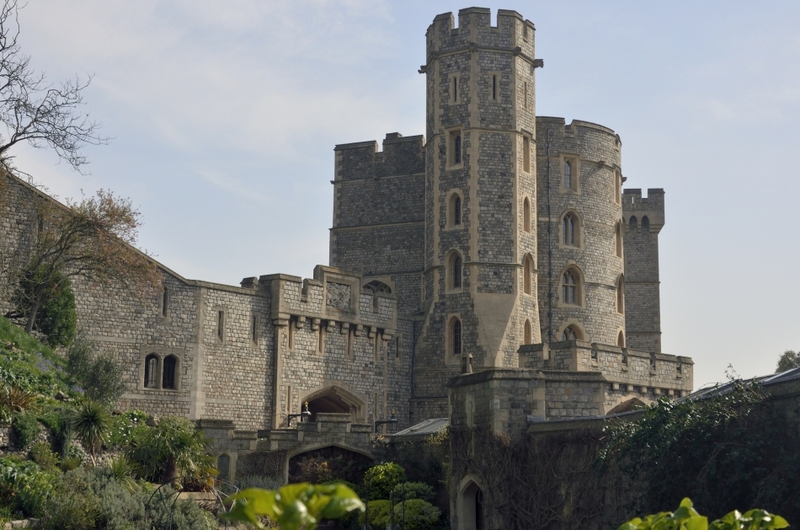 The castle was used as a prison from 1100 until 1952, though it's primarily a royal residence in its early history. As a whole, the Tower is a complex of several buildings set within two concentric defensive walls and a moat. 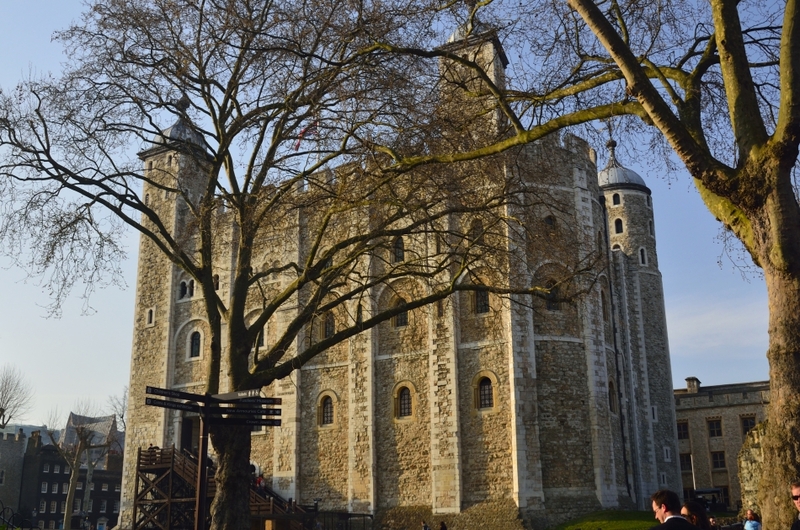 The Tower went through several phases of expansion, though the general layout preserved today was mainly established under Kings Richard the Lionheart, Henry III and Edward I in 12th and 13th Centuries. Tower of London was one of the several major regrets in our trip. We crammed it on the day with Westminster Abbey and other best attractions that by the time we went to the Tower of London we were all worn out. 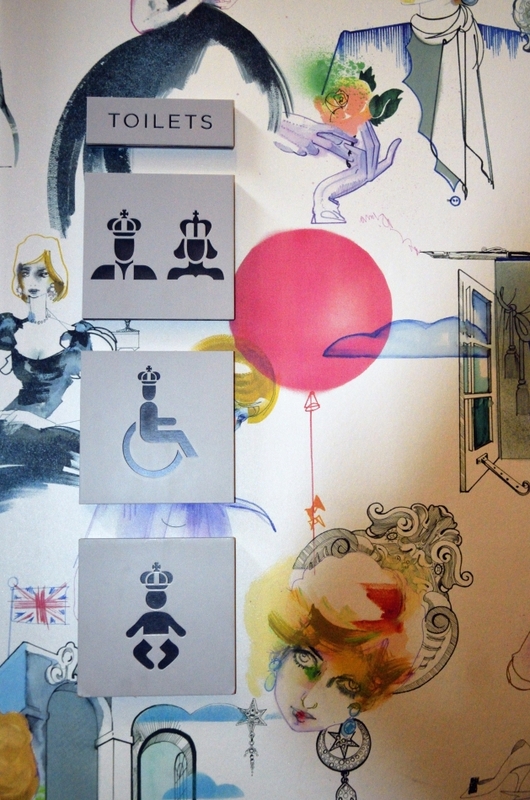 If I were to do it again, I would rather miss Kensington Palace and not the Tower of London. 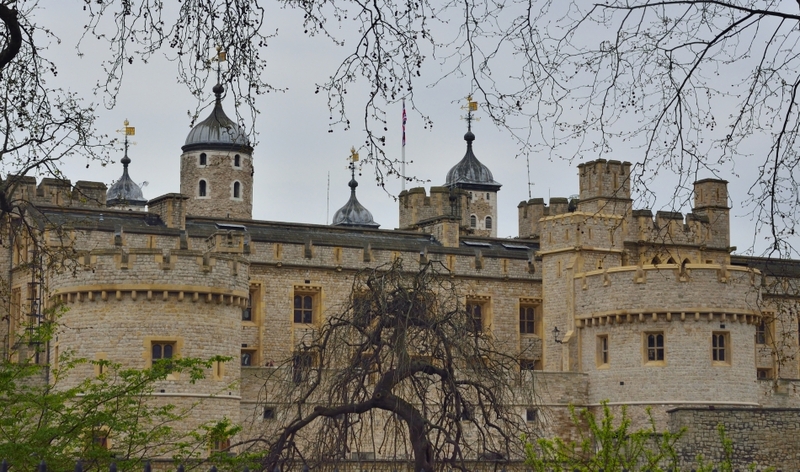 The Tower of London is open daily from 9:00 to 17:30 Tuesday through Saturday or 9:00 - 17:30 Monday and Sunday. Try to get there by 2 pm, so you have at least 3 hours to tour the magnificent fortresses, stone towers and displays of historic artifacts. Pick up rental car from London Heathrow Airport. You should plan ahead about transporting your whole travel group from your flat to London Heathrow Airport. Due to the many luggage and people, we hired the Express Airport Cars again to take us back to London Heathrow Airport. It takes 50 minutes to 1 hour during rush hour from central London to Heathrow airport and them could be late when they come too, so arrange an earlier appointment if you can. It will take at least another hour to settle all the car rental terms and get the papers before you can head on the road, I would suggest leaving your flat by 7:00 am, get to airport by 8:00 am and start on the road by 9:30 am. This way, you will get to the Stonehenge still in the morning. The Stonehenge at Amesbury is only 73 miles away or about 1 hour and 20 minute away by driving if you don't get lost. On the road, be extremely vigilant about reminding yourself to stay on the left side of the road. Care should be paid in particular when you are making turns. Remember, when you turn left, it's an easy turn into the lane right next to you. When you turn right, it's the harder turn that turns into the farther side of the lane from you, just the opposite from US. Ask your travel companions to watch out for your driving. You will get used to it after the first few hours. Stonehenge - There is one important reason why you want to get to the Stonehenge in the morning. In my opinion, the best place to take pictures of the Stonehenge is from the entrance side of the Stonehenge or the Northeast side where densely spaced sarsen stones are still remaining compared to the other side where stones are only sparsely scattered. That means if you stand at the northeast side these large stones are more or less facing the sun hence receiving better lighting for your pictures. I am able to tell you this thanks, once again, to our poor planning of arriving at the Stonehenge slightly after 5 pm. You can see how the stones in my pictures were basically all dark. Old Sarum - The other reason why you want to get to the Stonehenge in the morning is so that you will then have time to visit the 5000 year old iron age hill fort at Old Sarum. Old Sarum was the site of the earliest settlement of Salisbury, with evidence of human habitation traced back to as early as 3000 BC. At the center is a castle built by the Normans. 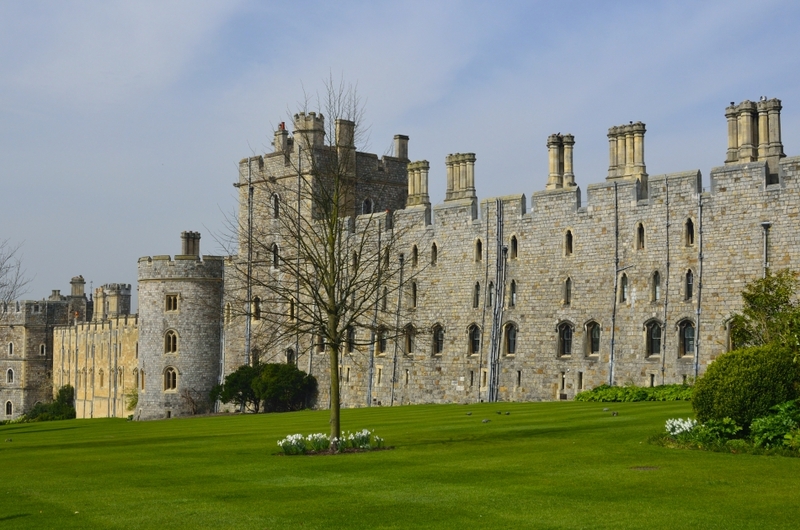 A royal palace was built within the castle for King Henry I. There is also a Norman cathedral at the western flank of the town. After the new cathedral in Salisbury was built in 1220, the cathedral in Old Sarum was demolished in favor of the new one and townspeople moved to the new city. Old Sarum is now open for tourist visits from 10:00 to 17:00. We totally missed it as we didn't see the sign in front of the Stonehenge entrance encouraging tourists to visit the Old Sarum until almost 7 pm. Try to get there by 3 pm if you can. Salisbury - Salisbury was not established until 1220, also called New Sarum to distinguish itself from the original settlement to the north of the city at Old Sarum. It's a cathedral city. 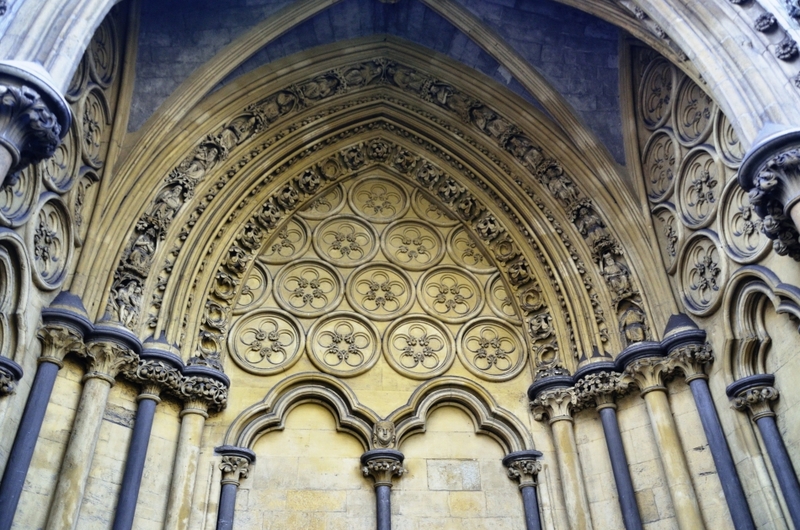 We stopped by the Salisbury Cathedral, which is one of the leading example of the Early England architecture. It has the tallest church spire, largest cloister and cathedral close in United Kingdom. The building of the main cathedral body took 38 years. Already inconceivably long for us, it was considered short for a masterpiece cathedral of this size. 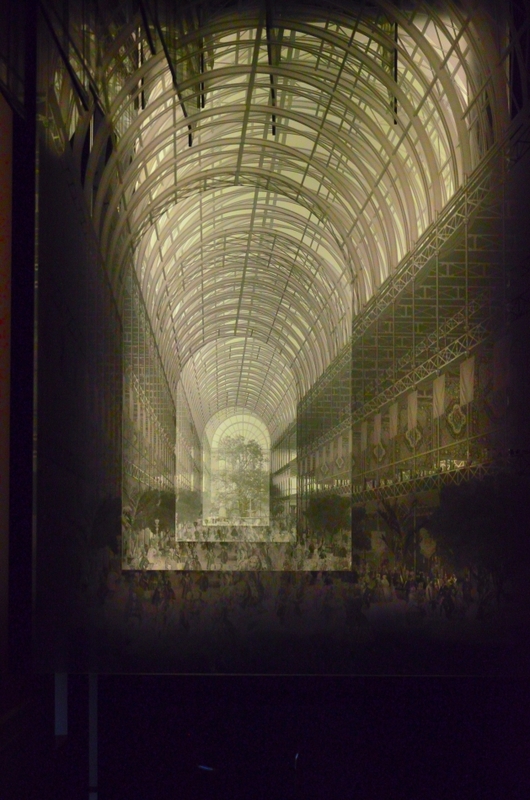 Ken Follett mentioned that the Salisbury Cathedral was one of the two models for the Kingsbridge Cathedral in "The Pillars of The Earth" novel he wrote. Arrived at our accommodation in Great Rissington way passed 9 pm. This was yet another mishap out of our not so perfect planning , arriving too late at our rented cottage and almost couldn't find the key to the cottage. We rented the whole cottage and the key was supposedly stored in a keysafe somewhere visible at the front of the house. We were lucky to find the cottage at all, because for some very peculiar reason the address to the cottage in Great Rissington doesn't have a street number, just the name of the cottage. The owner did however post very specific direction on the website, but unfortunately I didn't bring it. We had to interrupt a neighbor drinking at a nearby bar to walk us there. Once we got to the cottage, again, I forgot where the owner's agent said the keysafe should be and it was too dark to see if anything on the front of the cottage may be the keysafe. All 7 of us were like blind men trying to find a hidden elephant (a tiny one)! Finally we found it after what felt like ages and were all relieved to narrowly escape the fate of camping in the car for the night. The Cotswold region is a range of rolling hills in west-central England. The area is characterized by picturesque villages built out of the underlying Cotswold stone (a type of limestone). It has many well know towns that are attractive to visitors, such as Straford-Upon-Avon, the birth place of Shakespeare, located at the northern end of the Cotswold region. Followings are some well known villages and a medieval castle in the Central Cotswold. I wouldn't say that there is no way you can visit all the places listed below, just remember that you want to spend at least a good hour or two in each town, depending on all kinds of factors. Before heading to these places, draw out the route on the map. Estimate the travel time and time required for resting and lunch. Burford - Burford is thought to be the gateway town into to the Cotswolds. It was an old wool town and much of the town was built with the wealth of the wool trade. 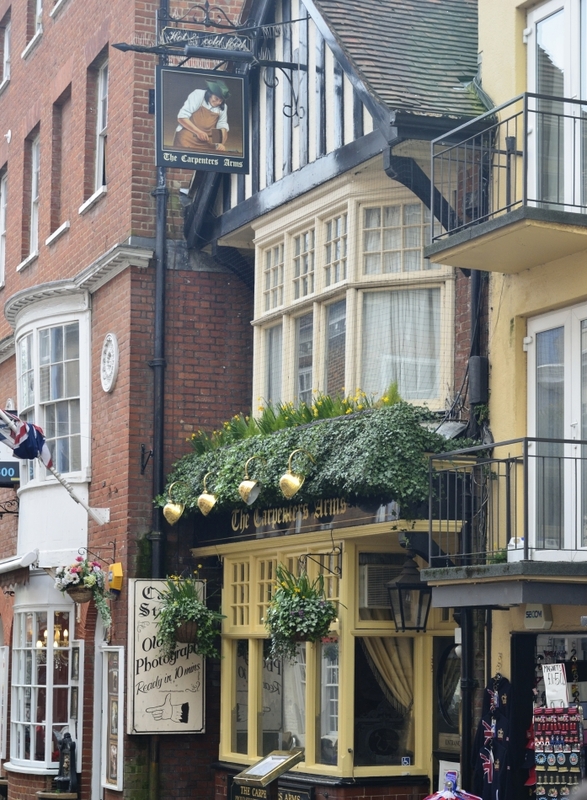 One of the main focus for tourists is the main High Street descending into the River Windrush with some of its best 17th and 18th Centuries frontages. It's also renowned for antique, tea and gifts shops. Bourton-in-the-Water - The River Windrush runs through the center of the town, hence Bourton-in-the-Water is also nicknamed "Venice of the Cotswolds". This is our favorite village. We even visited the model village in the town and were utterly impressed by the charm and beauty of the whole village, the real one as well as the model. Stow-on-the-Wold - Stow-on-the-Wold is located at the top of a 700 ft hill and has a long history. It was likely a prehistoric fortified settlement on top of the hill just like Old Sarum. The Market Square is large and impressive surrounded by magnificent antique shops, houses and inns. Morton-in-the-Marsh - Morton-in-the-Marsh is located on a flat piece of land that is still often flooded nowadays. The town's only street is lined with more affordable antique shops than other nearby towns like Stow-on-the-Wold. It's said that there is a Curfew Tower that's worth inspecting, but in our big hurry as usual, we didn't find the tower. The market day on Tuesday is still a lively event each week. Chipping Camden - It's said to be one of the most magnificent of Cotswold villages. The buildings are strikingly imposing and exuding an air of wealth. Stratford-upon-Avon - If you are planning to check out the Warwick Castle, you could stop by Stratford-upon-Avon which is about 8 miles southwest of Warwick. Owing to its being the birthplace of Shakespeare, The Royal Shakespeare Theatre receives millions of visitors every year. It is otherwise a market town lying on the River Avon, developed during the medieval time. Warwick Castle - Touring the Warwick Castle alone is a whole day event, so we just walked around the castle and the city Warwick. Same as the Tower of London, the original castle of the Warwick Castle was built by William the Conqueror in 1068, 2 years into the initial founding of Tower of London. The original motte-and-bailey castle was rebuilt in stone in the 12th century. It was used as a strong hold until the 17th Century. At one point in 15th Century, the Warwick Castle was used to imprison the English King, Edward IV, under the ownership of Richard Neville, known as "Warwick the kingmaker" who was the Warwick earl at the time. University of Oxford -University of Oxford is one of the oldest universities in the English speaking world, though it is not known when the University of Oxford was founded. Teaching at Oxford existed in 1096. In 1209, some academics fled to Cambridge due to disputes between students and the Oxford townsfolk forming the University of Cambridge. The university is a city university which means that it does not have a campus in traditional concept. The departments, colleges, accommodations etc are scattering throughout the city center. 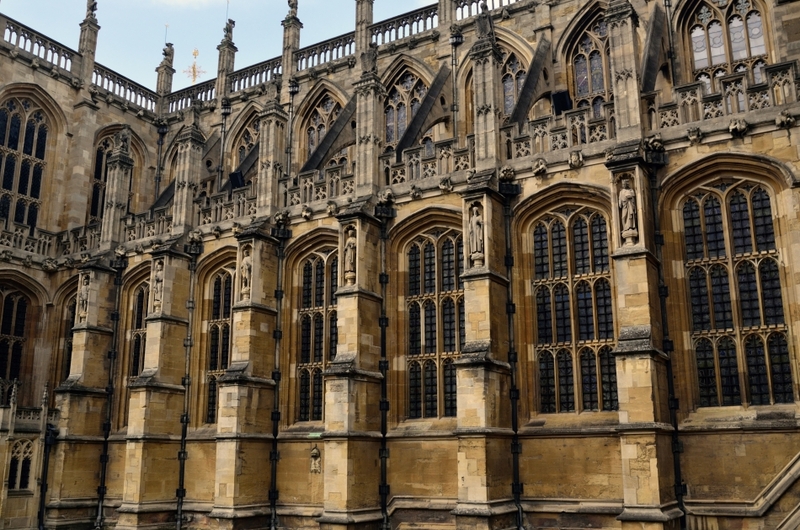 Several of the most imposing architectures at Oxford are All Souls College, The University Church of St. Mary the Virgin, Keble College, Redcliff Camera (science library), Clarendon Building, Sheldonian Theatre, Examination Schools and Christ Church Cathedral. Prepare a map like this to bring along to the campus tour. London Heathrow Airport - With much reluctance we ended our week of unforgettable journey by saying goodbye to the University of Oxford and headed back to London Heathrow Airport car rental place. On all evenings of the week, we would usually get back to our flat near the Vauxhall Station from 6 - 8 pm all spent physically. That's why I didn't arrange any activities in those evening. If you are the kind of night life person, you could go to one of those cinemas with bars, such as Curzon SoHo between SoHo Square and Leicester Square on Shaftestbury Ave., for a free movie and (free entry with London Pass with some restrictions) and stay at the bar afterwards on some evenings. 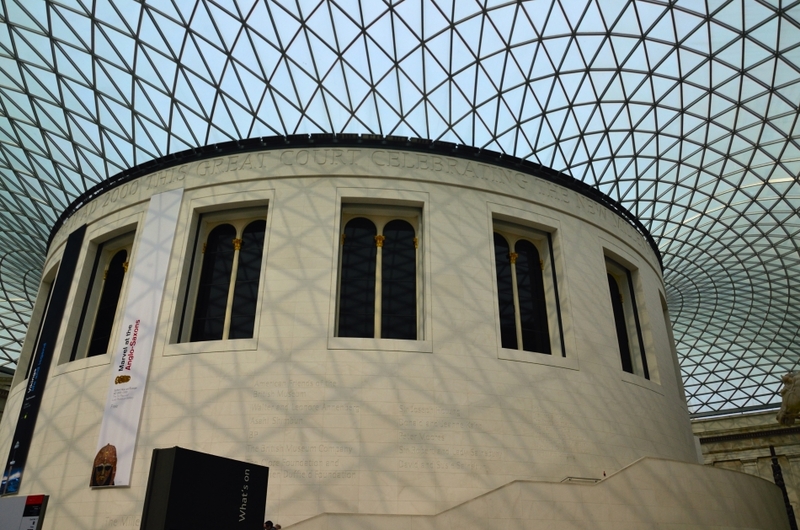 We eventually realized that the 3-day London Pass and the 6-day London Pass feature the exact same attractions in London, so you know you are visiting a mere fraction of these attractions with a 3-day London Pass. Though the 3-day Pass is still a great value, you know that if you can afford the time and cost, you should stay in London for at least 6 days. With 6 days at hand, I would visit Shakespeare's Globe Theatre, The London Bridge Experience and Tomb and maybe the London Museum. Instead of just passing by, spend a good whole day at Oxford University. Finally have one more day for Cambridge and its university. If you can afford the time, a 10-day first England trip would have been more ideal. Be it a 7-days or 10-day, you are in for one of your most unforgettable trips in life!